A strange, kind of slow paced movie with several shocking moments - not unexpected considering the shocking nature of the novel. Average at best, but pretty close to the book. Set in a Fascistic future America, The Handmaid's Tale tells the story of Kate, a handmaid. In this America, the religious right has taken over and gone hog-wild. 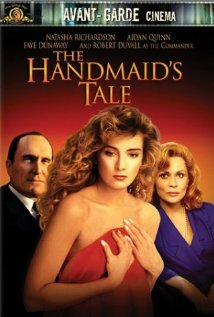 Kate is a criminal, guilty of the crime of trying to escape from the US, and is sentenced to become a Handmaid. The job of a Handmaid is to bear the children of the man to whom she is assigned. After ruthless group training by Aunt Lydia in the proper way to behave, Kate is assigned as Handmaid to the Commander. Kate is attracted to Nick, the Commander's chauffeur. At the same time, a resistance movement begins to challenge the regime.